I can't believe it's already the last post of 2013, and the last guest author spot of the year. So please help me in welcome Al Watt to the blog today to share tips on finding the source for our story, with a simple change in perspective. Al is the author of The 90-Day Novel, as well as The 90-Day Rewrite and The 90-Day Screenplay. He has written screenplays for numerous production companies and is the author of the bestselling novel Diamond Dogs (Little, Brown). He has won a number of awards for his writing including France’s 2004 Prix Printemps (Best Foreign Novel) and the American Library Assoc.’s Alex Award. He also offers writing advice and workshops at the L.A. Writer's Lab website, and his next workshops start January 27-- perfect for those who plan to make a "write my novel or memoir" New Year's Resolution for 2014. I began teaching novel and memoir writing at L.A. Writers' Lab in 2002. For a number of years, I had several students who fussed over their initial drafts without getting to the end. Although I knew the secret lay in getting your first draft down quickly, there was no system in place to foster this goal. I could encourage them to do so, but it made no difference. One day, while meditating, it came to me: The 90-Day Novel. I was going to teach a weekly workshop that guided writers through the hero's journey in three months. There would be a group page where the writers could interact with each other and share their daily experiences. There would be a daily letter from me, discussing not only craft, but also responding to their experiences. There would be a weekly Q&A on the phone where they could email me questions and I would write out coherent responses, and then we would discuss it. I had no idea if it would work. Some of the writers had never written anything more than a short story before, while a couple of writers had been trying to tell the same story for over a decade. What I discovered is that what is impossible to do in ten years becomes possible in three months, because in letting go of our story having to be perfect, we give it a chance to live. In other words, our idea of our story is not the whole story. Only by letting go, or holding loosely, this idea, can it become what it was always meant to be. As someone who has been fascinated with the creative process for years, I had a realization one day. I realized that a lot of writers get stuck because they are trying to solve their protagonist's dramatic problem. Every writing books talks about the dramatic problem, but, in fact, I discovered that there is no problem. There only appears to be one. In fact, what there is, is a dilemma, and when we tap into our protagonist's dilemma, we tap into the source of our story. The dilemma is the lens through which our theme is explored. It is source of all the conflict in our story. By connecting to the dilemma, we are freed from having the figure out our plot, because we are connecting directly to our characters' internal struggle, and it is out of this struggle that all conflict arises. At the heart of every story lies a dilemma. It is not a question of whether or not our protagonist has a dilemma, but rather how effectively it has been explored. By exploring our protagonist’s dilemma, we are led to the most dynamic version of our story. In fact, the dilemma is the source of our story, and it’s from this place that all tension and conflict arises. Exploring the dilemma helps distill our prose to its clearest meaning. It sheds light on what does not belong, those random digressions that are not germane to the central conflict and that may obfuscate its meaning. It offers clues to what still needs to be rewritten and leads us to the most effective order of events. A dilemma is a problem that cannot be solved without creating another problem. Many writing books talk about the dramatic problem, the thing that the protagonist is attempting to solve or overcome through the story. However, after years of working with writers, I have discovered that the notion of a dramatic problem actually limits the writer’s understanding of his story. When we approach our story as if our protagonist is struggling with a problem, we tend to try to figure out a way to fix it, which can short-circuit our work, because underlying our protagonist’s “apparent” problem is a dilemma. By inquiring into the dilemma, we begin to see our story from a wider perspective. STORY MAXIM: Problems are solved, while dilemmas are resolved through a shift in perception. The problems that our protagonist encounters address our story’s plot, but when we explore these problems as a whole we begin to notice underlying patterns that reveal the dilemma, and this relates to our theme. Typically, we tend to see our situations as problems. We may believe that if only we got the promotion our life would be better, or that if we lost weight, or quit smoking, or got a girlfriend, or moved out of our parent’s basement, then everything would be just fine. However, underlying these apparent problems lie a deeper reason for why we have not accomplished our goal. The fact is that the meaning we attach to our desire actually prevents us from achieving our goal. It is not that our desire is bad or wrong, it is that the meaning we attach to it assures its lack of success. I want intimacy, but I do not want to reveal myself. I want to be successful, but I do not want to overshadow my father. I want to move on from my mother’s death, but I don’t want to say goodbye to her. I want to know what happens when I die, so that I will know how to live. I want to have faith, but I do not trust God. I want to be forgiven, but I do not want to confess. I want love, but I don’t want to commit. I want to control my thoughts, so that I can have peace. I want to be true to myself, but I do not want to disappoint anybody. Notice how dilemmas are universal. When we ponder a dilemma, a story appears. We begin to imagine characters and a setting, thus bringing the dilemma to life. HOW DO WE IDENTIFY THE DILEMMA IN OUR STORY? If we believe that love will make us complete, we might set out on a search for love and misinterpret each relationship that does not resemble completeness as an absence of love. Or we might seek success because we believe it will bring us joy, and with each achievement we find ourselves despairing at the elusiveness of joy. Obviously there is nothing wrong with our characters wanting love, or wanting to be successful, but when they make meaning out of these goals they actually create the impossibility of achieving them. By exploring the meaning that our protagonist makes out of her goal, we begin to get a glimpse of her dilemma. STORY MAXIM: Our protagonist does not rid himself of his desire, but when he reframes the meaning he makes out of his desire, he is no longer ruled by it. The protagonist’s false belief is going to be tested through the story, and this will lead him to a new understanding. For example, in John Grisham’s The Firm, the protagonist, Mitch McDeere believes that money will solve his problems. He takes a well-paying job with a firm that he knows nothing about, and soon discovers that he is working for the mob and can never get out. It is true that money can solve some of his problems, but until he is willing to lose everything, he is a hostage to this false belief. We tend to focus on our immediate problems rather than on their underlying causes. Let’s say that our protagonist Bill has a few drinks at the bar, and while driving home he gets a DUI. At this point, he most assuredly has a problem, but underlying his problem may be a dilemma. Perhaps Bill is an alcoholic and wants to get sober but believes that he cannot survive the anxiety of sobriety. Although the problem may be the DUI and its attendant inconveniences, underlying this problem is the false belief that he cannot survive as a sober person. By noticing our character’s desire coupled with his false belief, we begin to see the dilemma. Get the first draft down quickly! 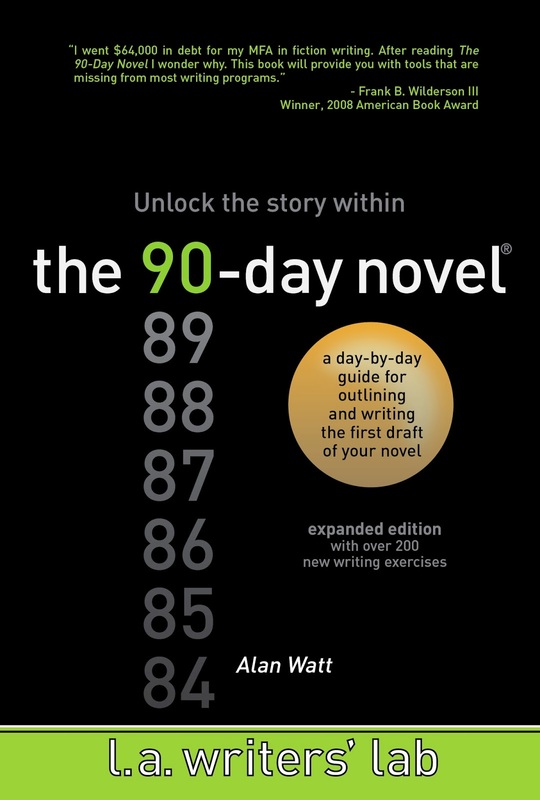 The 90-Day Novel is a day-by-day guide through the process of getting the first draft of your novel onto the page. The 90-Day Novel was workshopped at LA Writers' Lab over three years and has helped hundreds of writers complete their work. Some of his students have gone on to become bestselling authors and win major literary awards. The 90-Day Novel is structured into three parts. Part One describes the process of getting your story from imagination to the page and prepares you, through a few simple, powerful writing exercises to access the story within. Part Two is The 90-Day Novel, a series of 90 daily letters that will guide you through the hero's journey. Writers often tend to get stuck halfway through, mired somewhere in their "idea" of the story. The 90-Day Novel will show you how and why you got stuck, and how to get to the end of your first draft. Part Three is a compendium of stream-of-consciousness writing exercises designed to help you access the primal forces in your story, as well as the Structure Questions that will invite up images at key stages in your hero's journey. The 90-Day Novel teaches you how to distill your plot to its nature, and clarifies the mysterious process of assembling vague disparate images into a coherent narrative. Working in this way, story structure (which is often taught as a formula) becomes a springboard, setting you free to explore the far reaches of your imagination. "There are no rules," Watt tells us. "Stay out of your left brain, and let your unconscious do the heavy lifting." The 90-Day Novel clearly articulates the process of marrying the rigor of story structure to the wildness of the imagination, and in the process reminds us of something we so often forget...that writing is actually fun. Al Watt!!! Nice to hear from you again my man! I met you in Glendora CA at Barnes and Noble. I have that old Model A, still do, still have a finished novel about to go back to the editor but not until I finish the 90 day rewrite! BTW if you and Janice Hardy team up and make the ultimate how its done book on novel writing it would be the bomb... just sayin. Got your book on order @ Amazon can't wait to get it. Sounds like a good novel to look into!! I'm always on the look out for craft books!! Excellent information here. I look forward to re-reading this post and learning more. I love the explanation of the desire/false belief and will pass this along to all the writers I know. My first drafts come fast, but edits take much longer. Ordering the 90-Day Rewrite today. Thanks! Great post. Off to my writing wiki it goes! Very helpful, thank you. I'm printing this out for reference.